Build strength and endurance with this two-week program that's designed to be accessible for most levels of yoga experience, including newer practitioners who are up for a challenge. Sign up and each day you'll get one simple (yet potent) 20-minute class, each of which builds upon the last. This progressive program is broken down into three key focuses (lower body, upper body, and core), and the classes alternate each day between strength-building vinyasa flows and yoga-inspired strength and endurance drills. Midway through, you'll get a feel-good stretch class, and for your final class, you do a whole-body strengthening flow that ties everything together. Throughout, Kat provides plenty of variations so that you can customize the poses and drills to suit your needs and goals. If you're seeking a strength-building, cardio-boosting yoga experience that's easy to fit into a busy schedule, start here! 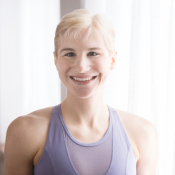 Kat Heagberg is the editor of Yoga International and has been teaching yoga since 2005. She loves to write about ways to make challenging poses more accessible, the power of language in yoga culture, and to offer encouragement and advice to new yoga teachers. Though she initially trained in alignment-based styles of yoga (which continue to inform her practice and teaching), Kat likes teaching vinyasa flow best of all. Read her work and take her classes here on Yoga International!